Why should you get appointed with an IMO? By using NAAIP's insurance marketing organization (IMO), you get access to industry highest contracts, The 123 Term Life Club. In addition, you will be regularly updated with the latest products and carriers and you will get assistance in coordinating and customizing your marketing efforts. No one in this industry has higher payouts to you, the agent. Money talks and **** walks! NAAIP's IMO has on-staff underwriters, case managers, sales consultants and attorneys to help you with more complicated cases. Sell life insurance NAAIP and receive high commissions, free leads, and more. Agents should come to NAAIP's Monday through Friday conference call at noon, ET to discuss the benefits of appointing to sell life insurance via NAAIP's IMO. Call 1-(888)532-9320. Exclusive to agents: Term life insurance quote engine at no cost or obligation to you. 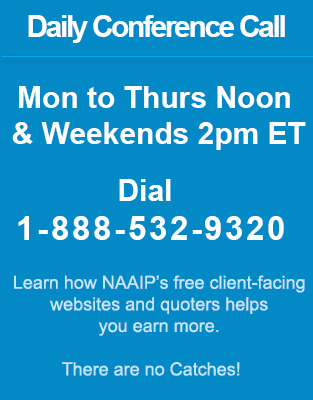 NAAIP offers agents free use of their industry leading LIFE INSURANCE QUOTE ENGINE to drive your business. Sign up for a NAAIP website right now. Click here to sign up for your free website and you get use of the life insurance quote engine forever with no strings or catches. Foresters has been in the life insurance business for more than 130 years, catering to the different financial needs of individuals and families nationwide. Their term life insurance is one of the most sought after products in the U.S, thanks to its affordability and numerous features. Mutual of Omaha has catered to the financial needs of individuals for the past 100 years. Mutual of Omaha's term life insurance is one of the best products in the insurance market. With its viable premiums, Mutual of Omaha is focused towards your clients. Term Life insurance is bought for a specific period of time. The amount would be paid to the beneficiary, in case if the insured person dies during the set time period. There would be no amount to be paid at the end of term, if the insured person is alive at the end of tenure. There are monthly premiums to be paid in order to keep the account status live. Term Life Insurance is considered to be the least expensive. There is no cash value built over a period of time in Term Life Insurance. The family of the deceased can claim death amount for the insured person. The term period would vary from one Term Life Insurance to another. It can be anything from one single year to the maximum of 30 years in total. Annual Renewable Term (ART) is another type of Term Life Insurance. There is an option to extend the plan every year. The plan can be renewed from 10 to 30 years. It is limited up to the age of 95. The premium amount keeps on increasing as the insured person becomes older. It would become impossibly difficult to keep on paying such high premium month after month. In level term life insurance, the premium amount remains level throughout the term life policy. The premium is calculated on the total cost of every year’s annual renewable term prices. The common terms for level term life insurance are 10, 15, 20, and 30 years. Usually, a policy holder has to shell out higher amount of premium for longer terms because the level of risk increases with age. Facebook became huge. A bunch of website builder companies that charge $10 per month have succeeded. We know this technology backwards and forwards. We started NAAIP which is a free website builder platform for insurance agents. To keep it simple NAAIP has one template. Extra features are included that are specific to insurance agents. Insurance companies compete to hire agents and give a 10% bonus to the recruiter of the salesperson. The goal is to get thousands of insurance agents to sign up and use our company's platform and a certain percentage of the agents will contract and make sales via the link that NAAIP places before them. We knew it would work. We currently have over 9,000 insurance agents registered NAAIP agents. Not bad for a simple website and quote engine program.